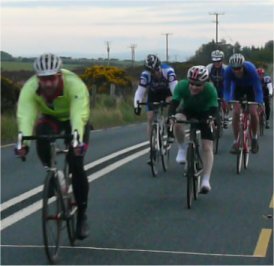 Thursday nights are traditionally known as club race nights for Bray Wheelers Cycling Club members, the club of which I am a long-standing member on and off since 1992. Despite this, until Thursday gone by, I had never competed in a traditional road race, having always preferred off-road riding and more recently the thrill of the Red Bull Road Rage competion. Sign-on was held from 19:15 and the racing began shortly after. As a handicapped race, I was placed several groups back, yet not quite in the scratch group. The course, a 30km out and back round trip, was relatively flat with a couple of drags along the way. It took me a while to settle down as the complete novice, but with a few friendly tips from fellow riders I integrated well and the group worked seamlessly maintaining the Belgian circle in fluid motion. Nearing the turnaround point the earlier groups of riders came against us. It would only be a matter of time before we would catch them on the return leg. The pace picked up and caused a split, with a few of the weaker riders unable to maintain the increased effort. As the race continued to near the finish, we managed to integrate into the front running groups. The nearer we approached the finish line the more frantic the peleton became, with attacks being launched ever increasingly. None stuck, but pulled the main group apart, stretching it back down the road. I sat awaiting the moment of destiny, positioning myself to strike when the time came, as we pulled around the last bend and into the long finishing straight. Watching, waiting, watching… Then the decisive attack was launched and I somehow instinctively sensed it was now or never and pounded into the pedals with what I had left, head down going for the line. I surged by the the initial protagonist of the move and suddenly found myself out front. A final burst for the line and I was able to start my road racing career in a fashion I could only have dreamed of moments before. This entry was posted on May 8, 2010 at 01:08 and is filed under Road racing. You can follow any responses to this entry through the RSS 2.0 feed. You can leave a response, or trackback from your own site.